Last weekend saw the Warley National Model Railway Exhibition at the NEC, as in previous years I have always endeavoured to round-up some of the news and items of interest from mainly a Southern / BR(s) perspective. It has been usual for some of the manufacturers to use the event to make announcements of new items or showcase updates to new products under development, this year however relevant new announcements of any kind were very thin on the ground. Hornby and Bachmann generally do not make new product announcements at Warley and will be announcing their new ranges in January next year, other manufactures such as Heljan made a couple of announcements in the week leading up to the Warley show. However I can post a few recent SR / BR(s) related updates / news below. The only Heljan SR related announcement leading up to Warley was the addition to their 009 range of Lynton & Barnstaple Railway Baldwin 2-4-2T Lyn that completes the Lynton & Barnstaple Railway locomotive fleet. Lyn was built by Baldwin in 1898 for the L&BR and shipped to Devon in kit form for assembly at Pilton Works. At the time, the railway needed additional motive power but Manning, Wardle was unable to supply a similar machine to those already in service (and further models of the Manning and Wardle locomotives will be available in December/January OO9 from Heljan, livery samples were on show and I shall possibly update this post with a couple of images in due course). The new model will depict Lyn in L&BR dark olive green and Southern Railway Maunsell green with authentic detail variations according to period and livery. The initial research work is underway and more details about price, features and specification will be announced later. Expected Release in 2020. Other new models recently announced by Heljan include a new class 86/1 in 00 and a Clayton Class 17 in 0. 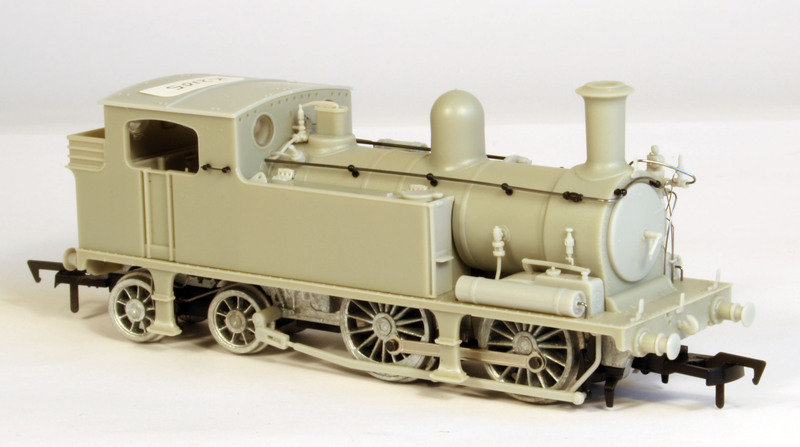 Rails Limited in partnership with Dapol and the National Railway Museum announced at this years London Festival of Railway Modelling in March that they will produce the LBSC Terrier and all its subsequent variants in OO Gauge. On display on the both the Rails and Dapol stands were a couple of Engineering Prototype tooling components in the shape of the one of the cab versions, boiler top and side tanks. It is still very early days in the process but good to see some progress being made and I look forward to seeing more of the EP parts etc in due course. I hope that comments previously provided to Dapol after the release of their first CADs get taken onboard further details and specification are still to be confirmed. Although as stated above no new announcements were expected or indeed made by Bachmann. The Class 159 DMU EP Picture courtesy and copyright Bachmann Europe. They had on display again the 2HAP (Class 414) EMU first announced in March 2016 Engineering Prototype, see my earlier post here for a couple of pictures. Three livery versions will initially be released being: BR green livery, BR blue & grey livery and Network South East livery. Also on display was the second Engineering Prototype stage is the the 3 car 159 Class annopunced in January this year which is being released as No. 159013 in Network South East livery. Very many thanks to all those who found me, somewhat out of my comfort zone, operating the Hornby Magazine West Coast Cement layout, being non Southern, DCC amd Modelrn Image… enabling me to at least talk about a few Southern topics… It was, as always, good to meet readers of this little corner of the web! Warley is one of the only shows where due to the nature of the other exhibitions taking place at the NEC where you can share a hotel lift heading for breakfast with a leather clad biker and hobbit in full cosplay outfit! Rails Limited in partnership with Dapol and the National Railway Museum announced at this weekends London Festival of Railway Modelling that they will produce the LBSC Terrier and all its subsequent variants in OO Gauge. With all the experience Dapol has gained from making the award winning O Gauge version of the A1 / A1X Terrier it is fully anticipated that this project will progress very quickly. Decorated samples are expected to be available Autumn 2018. A1 No. 82 Boxhill in LBSC Stroudley improved engine green. The tooling will allow eventually for most variations of the A1, A1X and IOW variants of the locomotive to be produced, including two cab/bunker types, two smokebox/boilers. Wooden and metal brake rigging where appropriate. Pricing has been announced as being £110.00 each (DCC Ready), DCC Fitted Versions £140 / DCC Sound Versions £239 with pre ordering being recommended and secured with a £30 deposit. What was previously known as the ‘Model of the Year’ awards have this year been promoted on RMweb, through British Railways Modelling Magazine and on the online MREmag.com as the British Model Railway Awards. As part of the evolution the categories were broadened to celebrate excellence and innovation in the wider British model railway scene. New awards now also cover retailers, websites, exhibitions and layouts, acknowledging the huge contributions they make to our hobby. The winners of the first British Model Railway Awards for 2015 have been announced today and can be read here. Congratulations to all the winners; and in particular the Kernow Model Rail Centre for winning the best 00 gauge steam locomotive for their ex London and South Western Railway Adams O2 class 0-4-4T , Graham Farish for winning the N gauge steam locomotive of the year with their original Bulleid Merchant Navy 4-6-2 and also Dapol for winning the best 0 Gauge steam locomotive with their ex London Brighton and South Coast A1 / A1X Terrier 0-6-0T, therefore ensuring that the Southern Railway is well represented in the awards, which is always good news. Also well done to the UK Model Shops website for justifiably winning the website of the year award, in which I was surprised and honoured for this humble web blog to have been nominated and came 4th, so many thanks to all who did take the time to vote. Today’s post is an update / catch up on the status of a few Southern Railway / Region related models that are in progress with a number of the Ready to Run manufacturers / commissioners. Regular readers of my blog will know that I have been assisting the Kernow Model Centre with their Southern related commissions and I pleased to be able to report progress on a number of fronts. Firstly: Production of the Adams O2 Steam Locomotives has now started and the first models will be leaving China in a couple of weeks time. This does mean that the pre-order special offer price has now ended, but they are still taking orders for these models. It should be noted that the amount of manual labour to assemble these highly-detailed models is very high and this is why the models will take a couple of months to actually produce. It is worth just considering that for a moment – a production line at the factory will be fully-occupied producing the O2 models for three months straight. Imagine that for every hour of every day, you will be inserting tiny pipes into the pull-push gear for months on end! To give a further taste of this there are some images and videos can be viewed on the Kernow Model Centre website here. Secondly: the first off tooling samples for the ex LSWR Gate Stock pull push sets have arrived in the UK and a few tweaks are being made before they can be signed off for production. 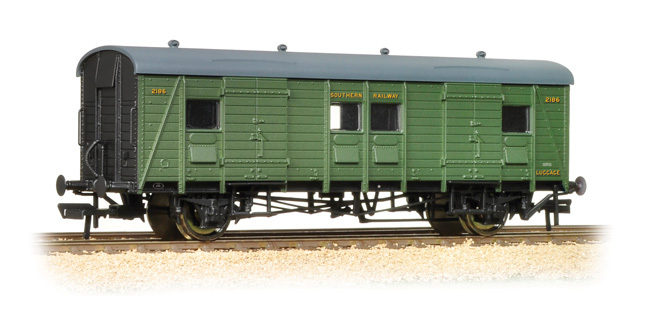 Further information on the Kernow Model Centre ex LSWR Gate Stock can be found here. Dapol have released images of the first livery samples of their 00 Class 73 diesel electric locomotives. There are still a few things to correct, including a spurious high intensity headlight on the BR blue version along with some number sizes and positions, but they advise these have been noted and will be corrected. 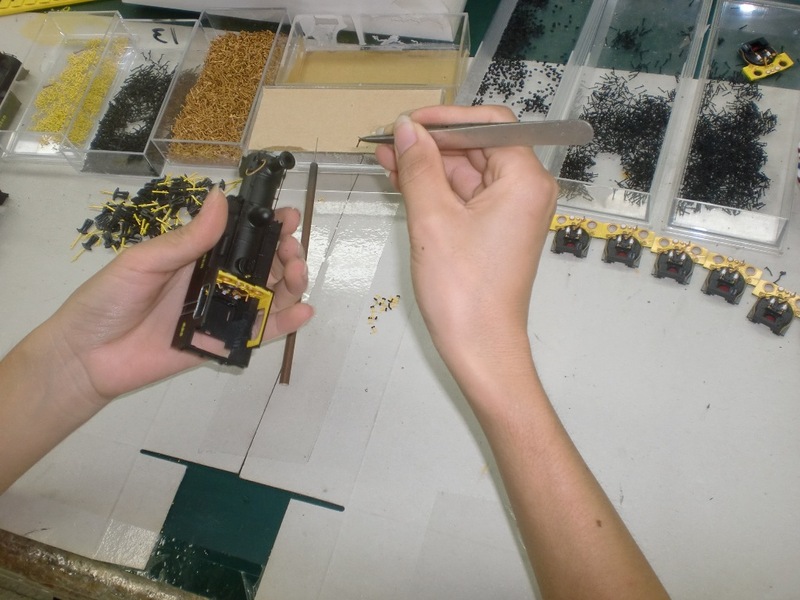 I am able to advise that work is continuing apace on the development of a number of SR / BR(s) models. I have been privileged to have been assisting the design team with some of the initial design work on the Bulleid Original Air Smoothed Merchant Navy locomotives that will be part of the 2016 range announced here and I can tease you that the CADS are looking great so far! Hornby have also released footage of the first running sample of their Class 71 3rd rail electric locomotive here. Today’s post is an update / catch up on the status of a few Southern Railway / Region related models that are in progress with a number of the Ready to Run manufacturers / commissioners from N to 0 gauge. Firstly: livery samples of the mainland version of the Adams O2 have now been received, a number of corrections made and already second livery samples returned in the last week or so. Once all the variations are finally signed off then production can start, along with the Isle of Wight versions that were fully signed off a while ago now. 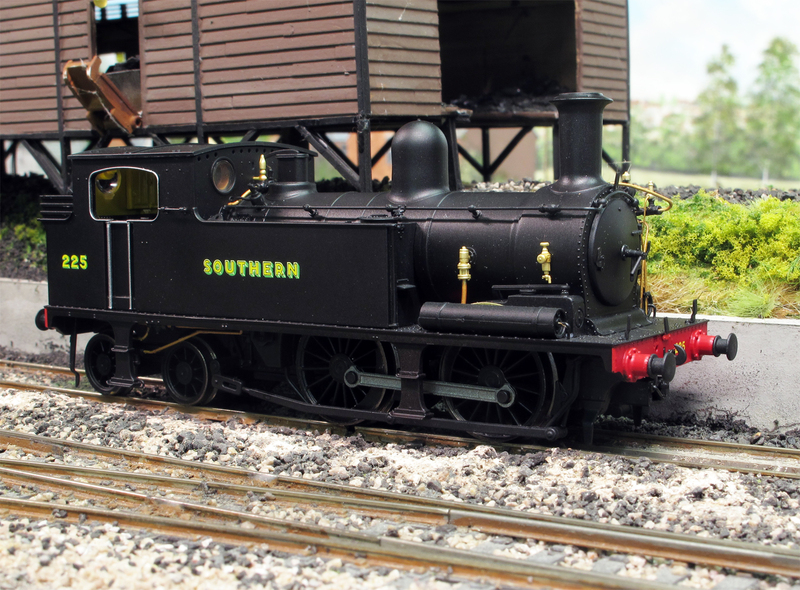 Further information on the Kernow model Centre O2’s can be found here. 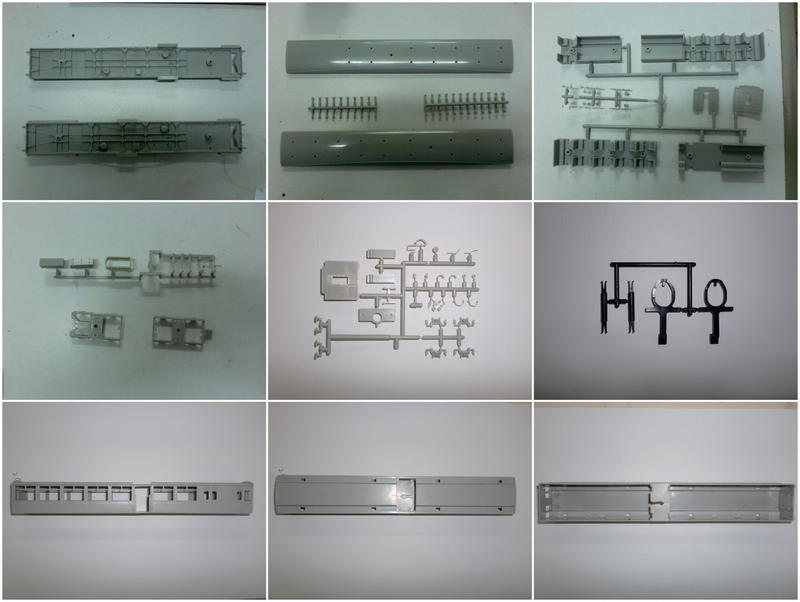 ex LSWR Gate Stock parts hot off of the injection moulding machines, can you guess what each part is? Secondly: It had been kept reasonably quiet, that the although the CADs for the ex LSWR Gate Stock Pull Push sets were previously signed off, tooling has actually commenced and The Kernow Model Centre have now received photographs of the first off components from the tooling. These now require assembly and shipping to the UK for inspection. Further information on the Kernow Model Centre ex LSWR Gate Stock can be found here. Lastly for now: I can also advise that work is also progressing in the background with updates and corrections to the CADs for the ex LSWR Dia 1541 10T road vans, first announced last September. So watch this space for further news. The first of the original Merchant Navy Pacific models that I reviewed in my post here have now actually started to appear with the retailers. The N Class Mogul 2-6-0 first announced in March 2013 is now on its way, with the review samples having been received by the model media so they should start to appear with retailers during July and August. Just like the Merchant Navy, I can vouch for the fact that it is an impressive looking model, especially for its size, and continues the increase in levels of detail for N Gauge Ready to Run models. A video of these models, but sadly not actually running, can be viewed on their website here. 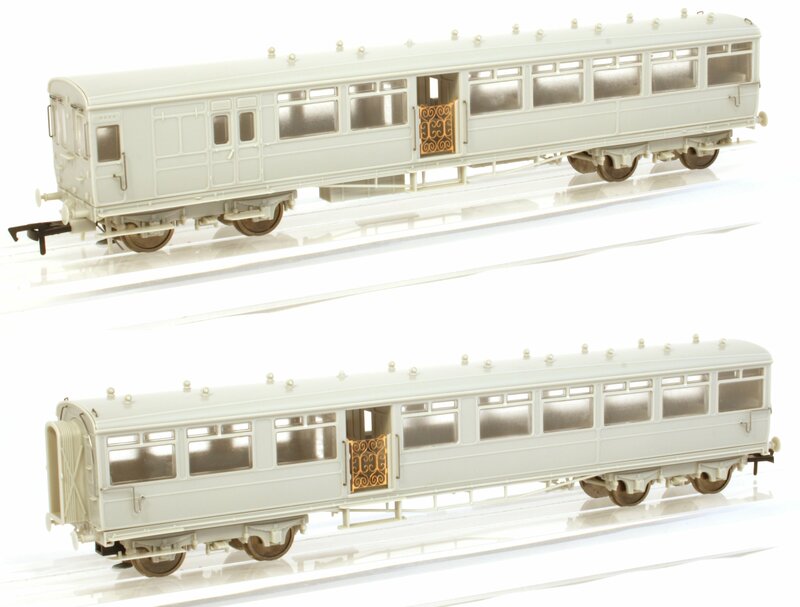 The livery samples for the Bogie Van B model have been signed off and the expected delivery of the of these models is currently due the end of August / September. 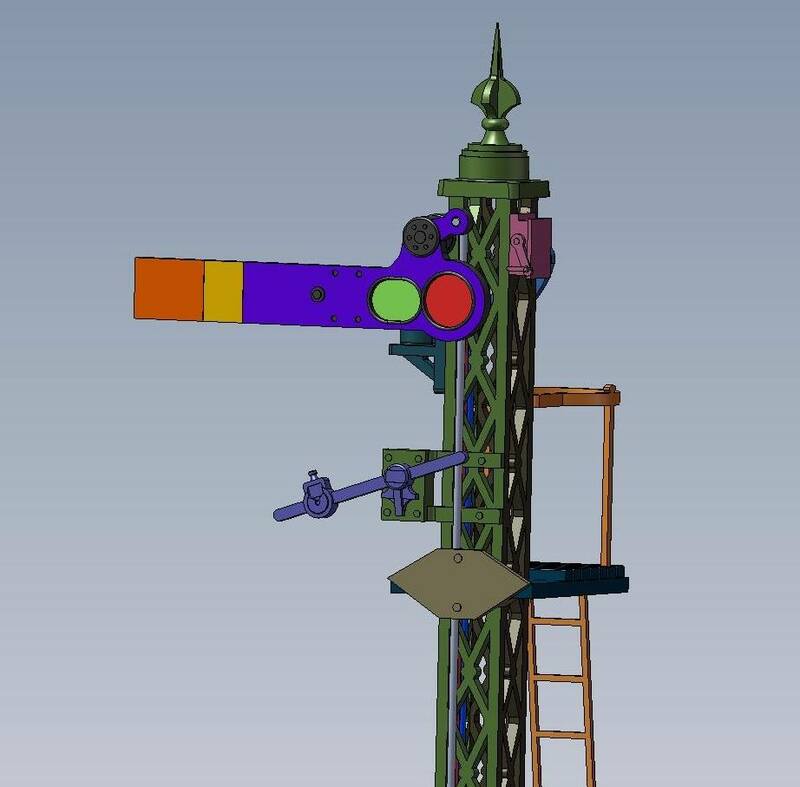 Dapol have via their Facebook page here (you do not have to be a member to access the page) Dapol have released CAD images of the planned 4mm working signals in both SR Rail built and also ex LSWR lattice post styles. [Edit:] Dapol have also advised 2mm version of these signals are planned. At the start of last month they also announced a delay to the O Gauge Terrier due to the the level of electromagnetic emissions. A slight modification is now required to the production which will result in delay in the shipment of the initial SR green and LBSC versions towards the end of July, however the BR and Bodiam variants are now due to be delivered three to four weeks later. I have also been informed that the CAD work on the first variants of the N Gauge Schools class first announced in July 2012 have been completed, I had already provided some corrections and information to Dapol for these a while back so it is good to hear that they are progressing, but no news as yet when tooling might actually commence. [Edit:] I have also been reminded that BR green liveried versions of the N gauge Maunsell coaches are due out next month and that Dapol have also now committed to bringing out a brake composite and four compartment brake third by Quarter 4 2015 and these are currently at CAD/CAM stage. This will make possible several prototypical set formations. Kernow O2 running sample arrives, and in other news…. Hot on the heals of the first Engineering Prototypes (EP) of the Kernow Model Centre ex London & South Western Railway (LSWR) Adams O2 class being received a couple of weeks ago as reported here, the first running sample has now been received. Whilst this running sample is substantially more complete detail wise than the first samples there are still a number of details to be added and this running sample, does not yet represent the finished models, although it is pretty much the Kernow Model Centre K2105 variant representing number 225 (the finished model will be in Southern Black with Bulleid sunshine lettering) as fitted with Pull Push gear. The left hand side of the running sample. It is good to see we are getting tantalisingly close, the next steps will be a few minor tweaks / corrections before moving onto livery samples. Bachmann have recently received the 2nd EP of their ex London Brighton and South Coast E4 class , the first EP images can be seen here, this 2nd EP incorporates one or two minor modifications following consultation with the Bluebell Railway, where the preserved E4 resides, and is now ready for livery samples to be produced. Pictures of the 2nd EP can be seen here on RMweb. 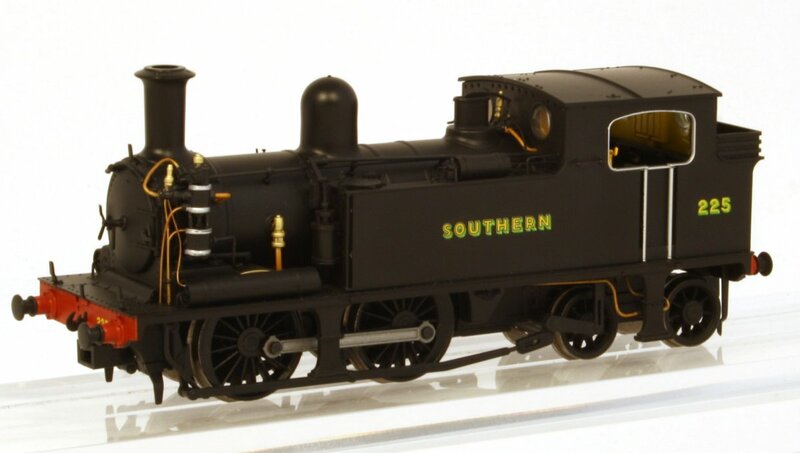 Latest deliveries from Bachmann with a Southern flavour include a couple of livery variants of the Wainwright C Class 0-6-0: 31-464 number 593 in Southern Railway Black livery with Green Lining and also 31-464 number 271 in simplified SECR lined green. Dapol have released a first image of the EP of their ex LBSC Terrier A1/A1x class which has been produced from completely revised CAD drawings after Richard Webster joined team at Dapol. The image can be seen here. Once again as with all tooling samples this does not necessarily represent a complete or correct variant as it may well be a combination of optional detail parts. Also about to hit the shops from Dapol in 7mm is the first of the SR 25t Pill Box Brake Vans. This first variant is the even planked Right Hand ducket version and was first tooled before Richard Webster started at Dapol. Whilst Richard was able to retool a couple of areas, e.g. the roof profile, of this model there are still a number of errors that will be corrected on later variants.